On Sunday, July 9 2017, parishioners of the Rossburn District participated in their Annual Pilgrimage to La Riviere for the 18th Annual Manitoba Passion Play. 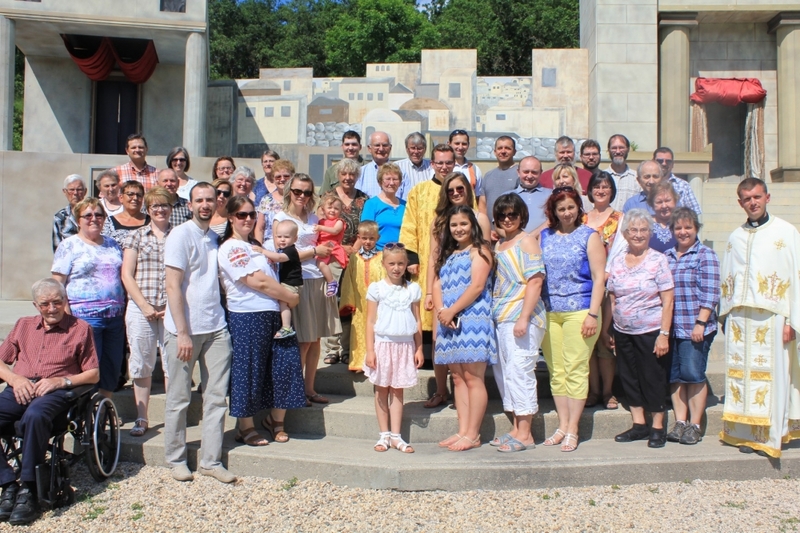 While this pilgrimage has become an annual custom for many parishioners in the Rossburn District, this year was the first year (some say in the history of the Manitoba Passion Play) where a Ukrainian Catholic Divine Liturgy was served on Sunday. Fr.Mykhaylo Khomitskyy organized the pilgrimage for his parishioners, and served the Liturgy. Following Divine Liturgy, all were invited to enjoy a potluck picnic, where there awaited a delicious spread of summer picnic favourites. It offered parishioners an excellent opportunity for fellowship, and to give them the energy they would need for the Meditation Trail! All parishioners were invited to participate in a bilingual Stations of the Cross, along the Meditation Trail. For those who have never taken a walk (perhaps hike would be a more appropriate word) along the meditation trail, it is especially rigorous! That did not discourage any parishioners though, as many carefully made their way along the steep path, sometimes supported by other parishioners. It was a beautiful experience to witness, not only in participating in the Stations of the Cross devotion, but to see parishioners supporting one another along the challenging inclines and declines. Of course, at the conclusion of the Stations of the Cross, many returned to their seats to prepare for the Passion Play to begin. Many were impressed by the high quality acting, elaborate set, and features such as live animals, and an orchestra providing background music to many of the scenes. Thank you to all those who were able to attend this grace-filled day. We look forward to seeing you, and welcoming you back to our Annual Pilgrimage to La Riviere next year!